Overlooking logs headed to the SDS lumber mill. SDS has manufactured lumber since 1946. Though we have seen tremendous changes in our sawmill throughout the years, our commitment to quality remains the same. SDS manufactures about 100 million board feet of premium quality lumber annually. We produce kiln dried 2×4, 2×6, and 4×4, all of which meet or exceed standards set by the Western Wood Products Association. Minimizing waste and maximizing recovery is key to our success; technology continues to provide us with the tools necessary to survive in today’s fiercely competitive and environmentally conscientious market. 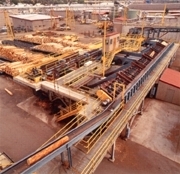 Our computer controlled, state of the art sawmill is one of the most efficient mills in the industry. SDS’ sawmill uses small, high quality logs. Before logs are sawn, they are scanned three dimensionally and then positioned for optimum recovery. Once sawn, boards are automatically sorted according to size, species and moisture content before they are dried, planed, trimmed, packaged and finally loaded onto trucks and rail cars for shipment. We are constantly upgrading and improving our sawmill to keep pace with new advancements in technology. Waste recovery, fast production, and consistent quality are essential to staying competitive. Our main product lines are end waxed and precision end trimmed. SDS has the flexibility to mix products on a given shipment.